On the occasion of Holi, CNBC Awaaz has released Top Holi Stocks of 2019. It is said that these stocks have the potential to spread green color in your portfolio. These stocks are suggested by five popular stock market experts Vikas Sethi, Gaurang Shah, Ravi Singh, Prakash Diwan, and Ashish Maheshwari. The name given to this program was Dhan Barse. 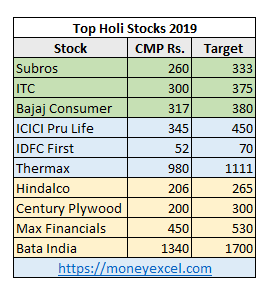 So, let’s add some color to your portfolio by investing in Top Holi Stocks of 2019. 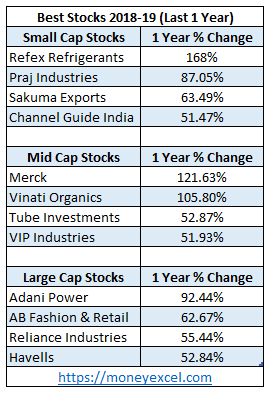 Before taking a look at best stocks of 2019 let’s look at the stocks that have given 50 to 100% returns since last Holi. Note – The stock performance given below is general stock performance. It is not of CNBC Holi Stocks. The stocks that have generated very good returns since last one year are Praj Industries, Merck, Adani Power, VIP Industries etc. The first recommended stock is Subros. Subros is Auto Air conditioner system manufacturing company. Subros is recommended stock by Prakash Diwan. As per Mr.Praksah Diwan Automobile sector is likely to do well and Subros is the beneficiary of the same. It is fundamentally strong stock & the target price set for Subros is Rs.333. ITC is second recommended Holi Picks for 2019. ITC is in the business of cigarettes, agriculture, FMCG and Hotel. ITC is a strong brand with very good fundamentals and balance sheet. This stock is recommended by Mr.Vikas Sethi. The target price set for ITC is Rs.375. Bajaj Consumer is next in the list of best stocks for 2019. Bajaj Consumer is in the business of personal care products. Bajaj Consumer is recommended by Mr.Gaurang Shah. He believes that product range and strong management will help this company to grow further. The target price set for Bajaj Consumer is Rs.380. ICICI Pru Life is next Holi Pick for 2019. ICICI Pru Life is recommended by Ravi Singh. ICICI Pru Life is a financial sector company. ICICI Pru Life is doing very well. The target price for ICICI Pru Life is Rs.450. IDFC First is next in the list of best stocks of 2019. IDFC first is an Indian Banking Company. IDFC First has a very good loan book for 1 Lakh Crore. This stock is trading at a lower valuation and it will be winning stock for the year 2019. Thermax is capital goods sector stock. Thermax is recommended stock by Prakash Diwan. Thermax is in the manufacturing of equipment which helps to reduce pollution. The demand of these types of equipment is likely to increase in the future. One can purchase Thermax with a target price of Rs.1111. Max Financial is a Life Insurance Company. Max Financial is recommended stock by Ravi Singh. Maxi Financial is delivering better financial result every quarter. The Insurance sector is likely to do well in the future. One can purchase Max Financial with a target price of Rs.530. Bata India is another very good stock for the investment in 2019. Bata India is front runner stock of India’s consumption story. The fundamental of Bata India is strong. One can invest in Bata India with the target price of Rs.1700. In addition to above stocks, Hindalco and Century Plywood are another recommended Holi Stocks by CNBC Awaaz Experts. Do you think these Holi Picks will give good returns in the future? « NPS Online Payment – How to make NPS Online Payment? WOW what are the returns of 2018 stock recommendations. This creates doubt as the list given by the author is different than the list given by Snehal Vankudre. Why there is a difference in the list itself. This creates doubt on the authenticity on the list as well as the post written by the author. The List Given by Snehal is last year Holi Picks (2018 year).The post is describing this year Holi Picks.